Jacques Vert. Navy Kitten Heel Slingback. Wedding Party Shoes. JAques Vert Salmon pink suede sling back ladies shoe.size 7. JAques Vert kitten heel sling back salmon suede wedding shoes.Very comfortable with a low sensible heel.Size 7 average width.Beautiful soft suede and a lovely terracotta //salmon pink colour. Jacques Vert Shoes size UK 5 Damson, excellent condition. Jacques Vert Shoes size UK 5. Really elegant kitten heels in dark damson suede and a gold trim. Sling backs like new and in original box. Condition is used but excellent. Originally £99. Dispatched with Royal Mail 2nd Class signed for. "JACQUES VERT". VIVID PINK SUEDE SLINGBACK SHOES WITH KITTEN HEEL. Lovely pink suede occasion sling backs from Jacques Vert with silver grey detailing worn only once for wedding, excellent condition in original box and matching clutch bag that also has shoulder strap, internal pocket and magnetic closure. STUNNING GENIUNE JACQUES VERT KITTEN HEELED PALE GREY AND MINT GREEN SLINGBACK SHOES AND MATCHING CLUTCH SHOULDER BAG. PALE GREY IN COLOUR WITH PALE GREEN CROSS OVER DETAILING. BAG HAS PALE GREEN TRIM ON THE OUTSIDE OF THE BAG THAT CO ORDINATES WITH THE DETAILING ON THE SHOES. Jacques Vert Leather Sling Back Heels Cream Pointed Toe Shoes UK Size 6 EUR 39. Condition is Used. Dispatched with Other Courier 3 days. HERE IS A LOVELY PAIR OF JACQUES VERT SLINGBACK SHOES IN SIZE 5.5 (39). THEY ARE NAVY & TURQUOISE & ARE IN EXCELLENT CONDITION-WORN ONCE ONLY FOR A WEDDING. 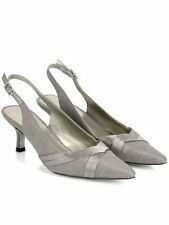 JACQUES VERT BEIGE SUEDE SLING BACK KITTEN HEEL SHOES UK 4. They are in good, used condition. NEW Jacques Vert lilac suede kitten heel sling back shoes. They still have the labels on but no box. Beautiful Mocha Brown Shantung Sling Back Shoes From Jacques Vert. Covered In Shantung Fabric In a Mocha Brown. Satin Ribbon Pleat Detail To Front Of Foot. Sling Back Strap With Buckle Fastener To Outer Edge. JACQUES VERT LADIES SHOES SLINGBACK STYLE LEATHER BROWN/CREAM/BEIGE - WALNUT- COLOUR POINTED TOE STYLE 2.7" APPROX MID HEEL CUT OUT DETAIL AT THE FRONT WITH A SWIRL CREAM STRAP. SIZE UK 5 EU (38) I CAN ONLY GO OFF SIZES THAT ATE STATED ON SHOES. USED PAIR OF SHOES WITH SOME MARKING ON INSOLE. WEAR ON SOLES ALL USED SHOES WILL COME WITH SOME WEAR ON THEM. HAVE A LOOK AT LAST TWO PHOTOS BEFORE YOU PURCHASE IN GOOD USED CONDITION. NO BOX WILL BE PACKED SECURELY HAVE A LOOK AT MY OTHER ITEMS FOR SALE THANKS. LOVELY JACQUES VERT SHOES SIZE 5. KITTEN HEELS. Jacques Vert. Ladies Size 6 Lilac Singback's. In very good condition. Worn just twice. Ladies Jacques Vert beige and black sling back shoes. Size UK 3.5 EUR 36. Heel height 2.5”. GORGEOUS JACQUES VERT SHOES SIZE 5 AND MATCHING BAG. REMOVABLE STRAP SO CAN BE USED AS A CLUTCH BAG. INNER POCKET. PRETTY BOW AND SATIN DETAIL TO SHOES. Jacques Vert shoes size UK 5 / 38. These gorgeous Jacques Vert shoes are ideal for any special occasion. Colour / shade Dew Pink. The Shoes feature a kitten heel. And for the small print……. JACQUES VERT LADIES SHOES SLINGBACK STYLE POINTED TOE STYLE BOW FRONT DETAIL SHEEN TEXTILE FABRIC MATERIAL SIZE UK 5 EU 38 CUSHIONED INSOLES FOR EXTRA COMFORT BUCKLE SLINGBACK STRAP FASTENING 3.5 APPROX MID KITTEN HEEL COME IN A BOX TURQUOISE/AQUA BLUE- COLOUR WORN FOR 2 HOURS IN EXCELLENT USED CONDITION LIKE NEW MARK ON SOLE LOOK AT LAST PHOTO BEFORE YOU PURCHASE HAVE A LOOK AT MY OTHER ITEMS FOR SALE THANKS. In box and worn only once. Size 5.5 ladies Jacques Vert slingbacks. Worn for a wedding. Comfortable and flattering shoe. Jacques Vert Sling Back Sandals, Size 5. Espresso range. (mainland ONLY, see exclusions below). I will do my best to answer them quickly. LADIES JACQUES VERT SIZE 6 ( EU 39 ) PRETTY KITTEN HEELED SHOES WITH MATCHING CLUTCH BAG, (WITH REMOVABLE SHOULDER STRAP) BOTH GOOD USED CONDITION ( CHECK PICTURES FOR CONDITION ) THE BAG HAS BEEN USED ONCE THE SHOES WORN TWICE SO STILL GOOD CONDITION AS PER PICS. By Jacques Vert. "Wine & Oyster" Range of clothing. Burgundy Satin & Oyster contrast detail. UK Size 6 ~ EUR 39. This is a Designer Pair of Shoes. More of a size 5.5. Heel height: 2.5 ". Grab a fantastic bargain. Jaques Vert Shoes Size 5 with matching hand bag in pale green . Comes with scholl gel cushion. Worn only once with gel cushion and once before gel cushion so in two occasions: wedding and marriage ceremony; a few hours in total. Will be dispatched with Royal Mail 2nd Class in box. Nice sandals/shoes by JACQUES VERT. features slingback fastening with buckles. textile upper shoes in green. They have been used peelings in their lining and. From the "Darjeeling" Range. by Jacques Vert. UK Size 5 ~ EUR 38. Silver Grey Leather with. Soft Pink contrast detail. This is a Designer Pair of Shoes. More of a size 5.5 to 6. due to the square toes. LADIES JACQUES VERT SIZE 6.5 ( EU 40 ) PRETTY KITTEN HEELED SHOES WITH MATCHING CLUTCH BAG FROM THE JEWEL RANGE, (WITH REMOVABLE SHOULDER STRAP) BOTH GOOD USED CONDITION ( CHECK PICTURES FOR CONDITION ) THE BAG HAS BEEN USED ONCE THE SHOES WORN TWICE SO STILL GOOD CONDITION AS PER PICS. Jacques Vert Powder Puff Range boxed lovely condition. Jacques Vert shoes. Powder Puff Range / Cream size 5.5 / 39. slingback shoes, kitten heels and adjustable heel strap. Cream with a black trim. must not be removed. GORGEOUS JACQUES VERT NAVY BLUE WITH CONTRAST MID BLUE TRIM KITTEN HEELED SLINGBACK SHOES WORN TWICE COMPLETE WITH THEIR MATCHING JACQUES VERT CLUTCH / SHOULDER BAG WITH FOLD AWAY STRAP. BOUGHT FOR A WEDDING & ANOTHER EVENT. This is a gorgeous pair of shoes from Jacques Vert, they are a champagne beige colour in a silk like textile material with a black satin bow and trim, they have a slingback strap and they are in beautiful condition. Jacques Vert Shoes Bag & Fascinator. Colour shade Blue. This Gorgeous matching set is ideal for any special occasion. Matching sinamay disc headband features a flower corsage. The Shoes feature pleating & bow detail on the front.